Part of Wednesday night’s vigil ride. Photo: Streetsblog. 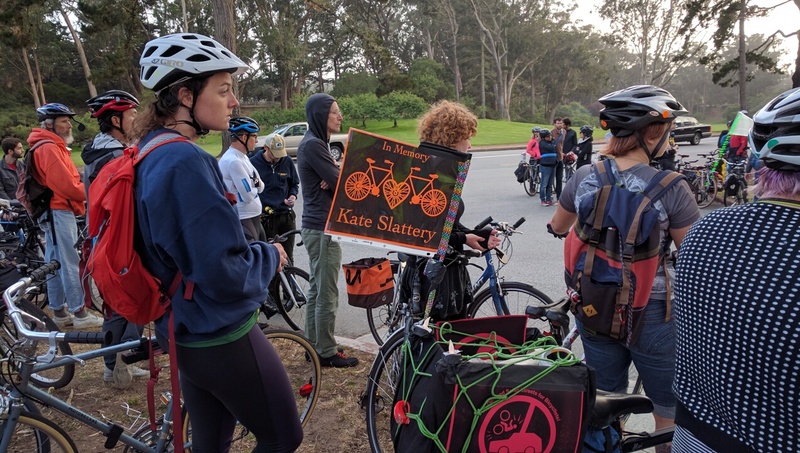 Wednesday evening, some 200 cyclists assembled around the William McKinley Monument in the Panhandle to begin a ride and vigil to remember Heather Miller and Kate Slattery, two cyclists killed in separate incidents one week ago. The ride was organized by the San Francisco Bike Party (SFBP). Riders assembled at the end of the panhandle for the vigil ride. Photo: Streetsblog. One of the first to arrive was Paul Santagata, a Google employee who lives in the Mission. He sat on the base of the William McKinley Monument as cyclists came into the park. Santagata is the man who helped apprehend Farrukh Mushtaq, the suspect in the hit-and-run killing of Kate Slattery. “I was driving back from work at 8 p.m. on Howard and thought I was going over to the car of a victim of a hit and run…I dialed 911,” he explained. He saw a man near the wrecked car. “After my description, they [the police on the phone] described that he most likely was involved in a hit and run on a cyclist,” he said. The dispatcher on the phone asked him to try and keep the man there. 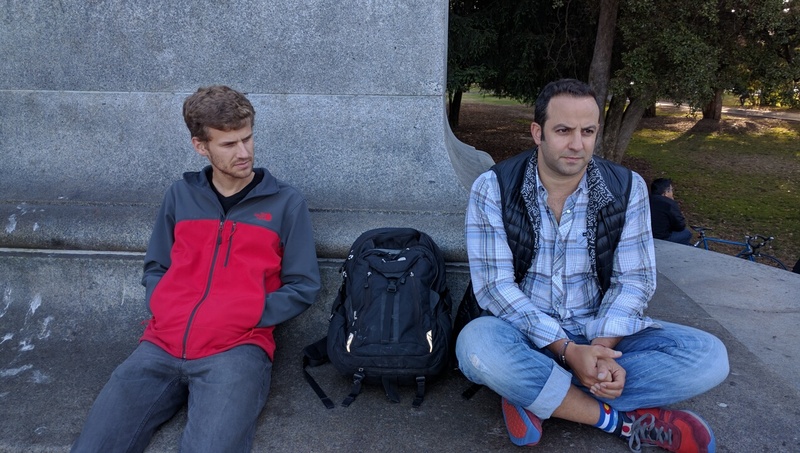 “Me and a couple of other folks got him to sit down until the police came.” Santagata cycles daily and decided to come to the vigil to get a sense of closure. Tom Rohlf and Paul Santagata were two of the first to arrive. Photo: Streetsblog. Next to him sat Tom Rohlf, a friend of Slattery and also a regular cyclist. “I’m just remembering her,” he said. Devon Warner, who runs San Francisco’s Ride of Silence, was also there. The previous night she was at the Bicycle Advisory Committee, which she said was well-attended and contentious. “It was pretty emotional, with more public comment [than usual],” she said. It was a real-life game that had horrific consequences. The driver of the Honda that hit Miller is still at large. A man handed out flyers, urging people to call 415-575-4444 or to Text a Tip to TIP411 and to “begin the text with SFPD” if they have any information on the driver who killed Miller at 6 p.m. on Wed., June 22., at JFK Drive at 30th. Riders clustered around the ghost bike shrine for Heather Miller. Photo: Streetsblog. The ride, which was not escorted by police, first went to JFK and 30th. It was slow going, since the large group had to split up and wait at several intersections. 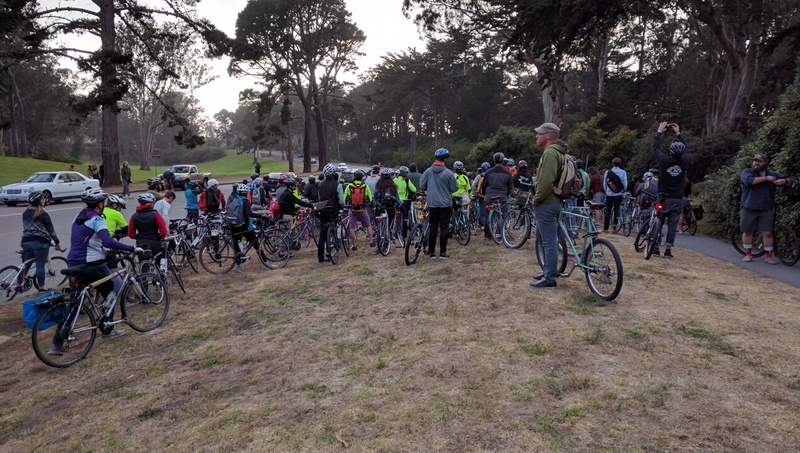 Throughout the ride, people remarked on how fast cars were going up and down JFK drive, which, as the San Francisco Bicycle Coalition pointed out in a release after the deaths, has no bike lanes in the western part of the park. The ride was quiet and courteous, with cyclists helping each other leave openings for cars to slip through at the intersections. Several people lit candles, took pictures, and knelt at the white ghost bike for Miller. Christopher Ulrich pays his respects at the ghost bike for Heather Miller. After about an hour, the group made its way slowly down the Wiggle, back to Market Street. Randall Dietel, who was featured in a recent CBS news report after he was attacked by a motorcyclist for attempting to enforce the Golden Gate bike lane, carried a radar gun. He continually clocked speeding motorists, including one that sped down Howard at 65 mph, right past the spot where Slattery was killed. Despite the vigil, cars continued to speed unabated up 7th. One was clocked at 65 mph by radar. Photo: Streetsblog. Friends hugged and cried around Slattery’s shrine. They placed candles. Mostly, people stood silently, including San Francisco Supervisor Scott Wiener, who attended the event. 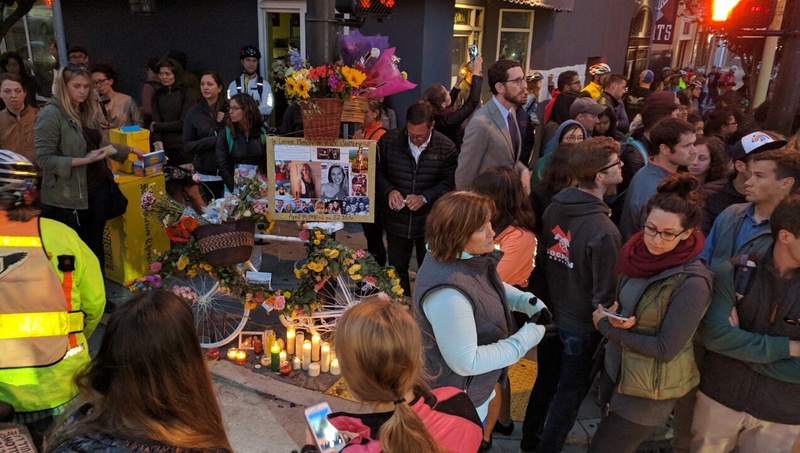 Jane Kim, whose district encompasses the intersection, reached out to Streetsblog via phone but was unable to connect. However, through a deputy she said she will hold hearings to try and shame the SFMTA into providing actual safety infrastructure–meaning protected bike lanes–instead of compromises and paint. They cried and remembered Kate Slattery at a shrine at 7th and Howard. Photo: Streetsblog. I do not think it’s the SFMTA that needs the shaming. Does Jane Kim think that the lack of progress is the doing of the SFMTA? It seems to me this is way more about speed than about infrastructure, and speed is more about enforcement, and enforcement is SFPD, and SFPD is Lee. Andy Thornley promises to shut down through traffic on JFK, which is long overdue, and that’s a position the mayor would need to support as well. 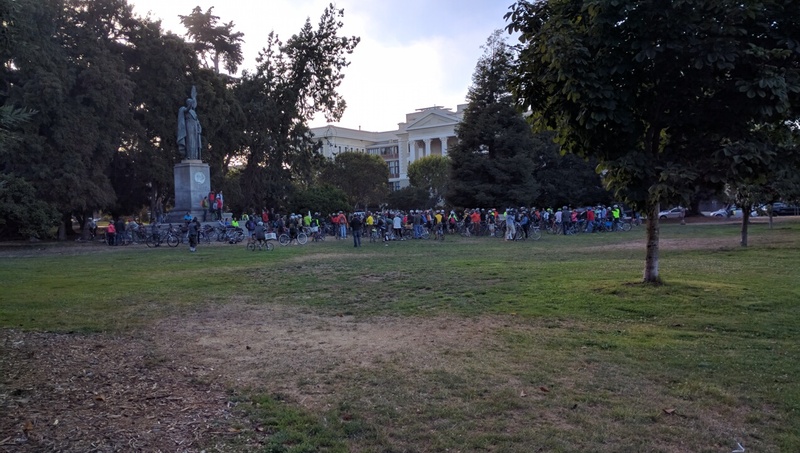 Did SFPD show up to block the bike land and blame the victim again? Yeah, that stretch of GGP is a 60 mph freeway. 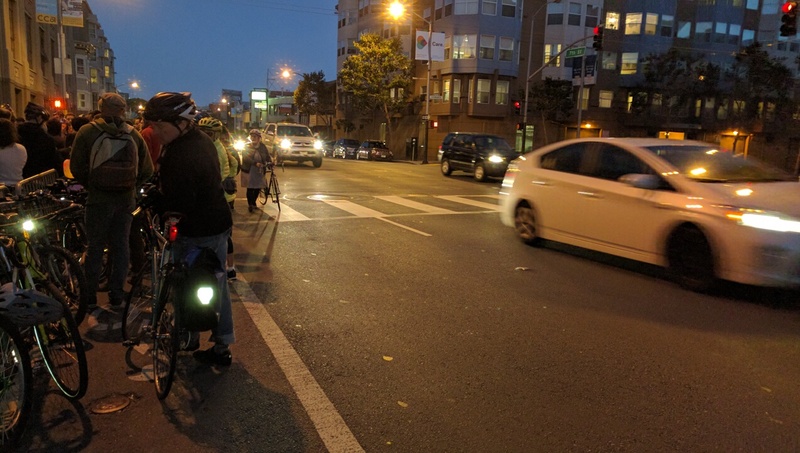 Crash on Potrero: Injuries are Not Enough to Get Safer Streets? 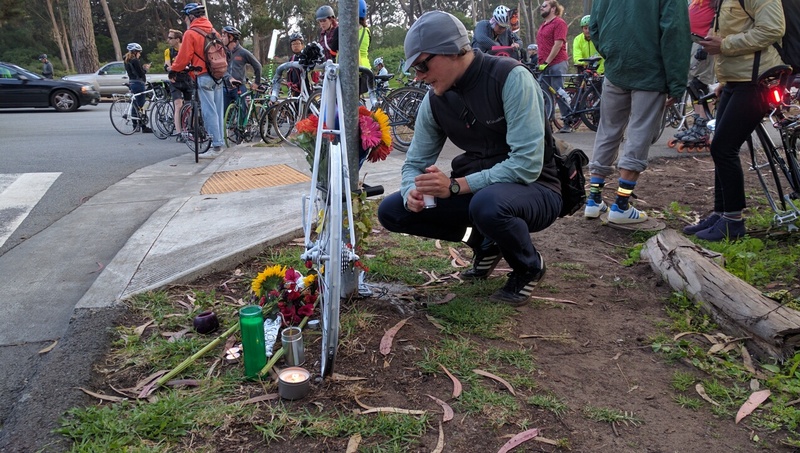 Two San Francisco Cyclists Killed: What Now?